The Karla Caves are the largest cave temples (Chaitya) in India. These caves are located near hill resort of Lonavala. The Karla Caves are located at a distance of 12 Kms. from Lonavala. The Karla Caves are one of the important place of tourism attractions This is must visit Karla caves. The Buddhist caves at Karla are one of the finest examples of ancient rock-cut caves to be found in India. The magnificent hall that adorns the main cave reflects the high degree of architectural skills of the artisans who carved and embellished the caves on such a difficult terrain. The Karla Caves were built around 100 AD by the Buddhist nuns. The karla caves are located at Karli . The Karla caves are the largest cave temples in India. The Karla Caves are one of the complex rock cut architecture of ancient India. These caves were developed over two periods - from 2nd century B.C to 2nd Century C.E and in 5th - 10th Century. Even though the Karla Caves were constructed over a period of time, the oldest of these caves is believed to date back to 160 B.C. The Karla Caves are on a major ancient trade route, running eastward from the Arabian sea into the Deccan. These ancient caves are the popular tourist attractions now. We can see the inscriptions and stupas at these caves . 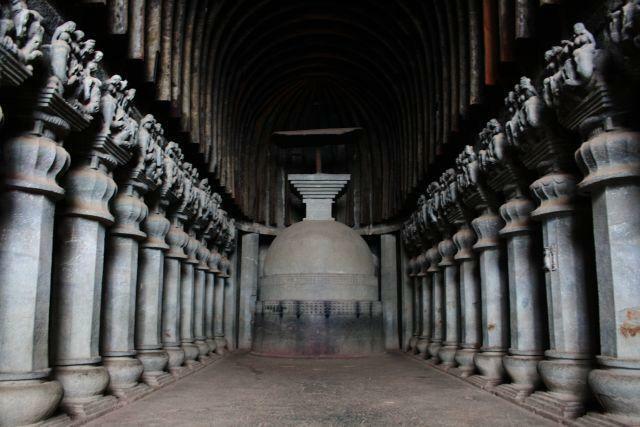 The Karla caves encloses Buddha viharas, where by the monks were stayed during their meditation period in the caves. The cave encloses sculptures of elephants adorned with metal jewelries and ivory tusks. 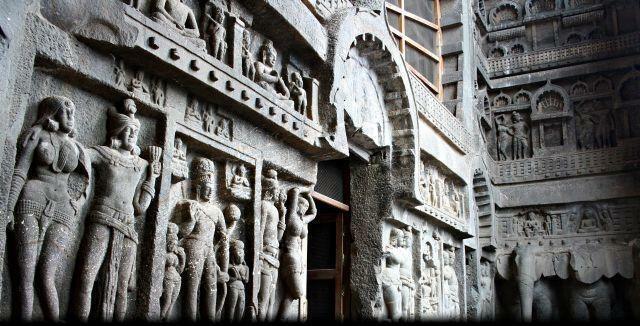 These marvelous ancient karla Caves are presently a popular tourist destination to have a close look at the ancient Buddhist architecture and culture. These caves exhibit Buddhist ideologies through inscriptions and stupas. The main cave has a magnificent Chaitya with 37 huge octagonal pillars. There are well carved sculptures of both males and females, as well as animals, including lions and elephants. Also Read: What is the best time to visit Lonavala? Chaitanya hall is the major attraction in Karla Caves. Chaitanya hall in these Caves consist of chiseled sculptures and pillars of very good architecture. The great structural design of the Chaitanya hall in these caves is really a must to see. One pillar in the Karla Caves has four lions at the top of it. Our India has adopted this design in Karla Caves as our national emblem. A number of rock structures are there in these caves showing animals as well as various forms of humans. There is a stone stupa, placed under an umbrella and carved with figures of men, women and elephants. This 37 pillars chiseled with the figures of prosperous men and women on elephants, bowing before Lord Buddha, add to the attraction of Karla caves. The Karla cave complex comprises of a number of prayer halls, which have been carved with great precision. Then, there are also a number of viharas, dwelling places for the monks, which have been similarly ornamented. All these prayer halls and viharas date back to the time of the Hinayana Buddhists and have arched entrances and vaulted interiors. There are no images of Lord Buddha in the caves, only symbolical descriptions. The portico of Karla caves is carved in such a way so as to give it an appearance of finished wood and has a large horseshoe arch as the central motif. Related: How to Reach Lonavala? Karla caves are located between the important cities of Mumbai and Pune, and can be easily accessed from both. Karla is about 120 km from Mumbai and about 55 km from Pune. Karla does not have an airport and the nearest airports are located in Mumbai and Pune. Both Mumbai and Pune are important railheads near Karla, but the local Malavli rail station is in Bhaja village, which is located about 5 km south of Karla town. The actual Karla caves are located north of the small town of Karla and can be reached after a steep climb of around 20 minutes. Travelers can also take buses and taxis from Mumbai and Pune to reach Karla caves. 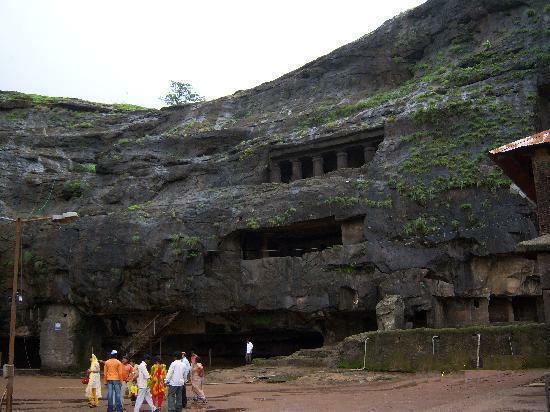 The important hill stations of Lonavala and Khandala are located close to these ancient caves. This place is just 11 km west of Karla town, while Khandala is 16 km from here. Buses plying between Mumbai and Pune generally halt in Karla.